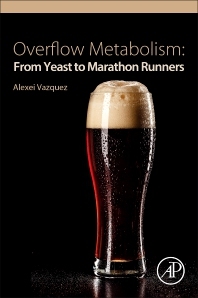 Overflow Metabolism: From Yeast to Marathon Runners provides an overview of overflow metabolism, reviewing the major phenomenological aspects as observed in different organisms, followed by a critical analysis of proposed theories to explain overflow metabolism. In our ideal view of metabolism, we think of catabolism and anabolism. In catabolism nutrients break down to carbon dioxide and water to generate biochemical energy. In anabolism nutrients break down to generate building blocks for cell biosynthesis. Yet, when cells are pushed to high metabolic rates they exhibit incomplete catabolism of nutrients, with a lower energy yield and excretion of metabolic byproducts. This phenomenon, characterized by the excretion of metabolic byproducts that could otherwise be used for catabolism or anabolism, is generally known as overflow metabolism. Overflow metabolism is a ubiquitous phenotype that has been conserved during evolution. Examples are the acetate switch in the bacterium E. coli, Crabtree effect in unicellular eukaryote yeasts, the lactate switch in sports medicine, and the Warburg effect in cancer. Several theories have been proposed to explain this seemingly wasteful phenotype. Yet, there is no consensus about what determines overflow metabolism and whether it offers any selective advantage. 6. How fast can a cell grow? Alexei Vazquez began his studies in Physics at the University of Havana, where he obtained a BSc and MSc degrees in 1995 and 1997. In 2002 he obtained a PhD degree in Statistical and Biological Physics from the International School of Advanced Studies in Trieste. Subsequently, he held postdoctoral positions at the University of Notre Dame in Indiana and at the Institute for Advanced Study in Princeton. From 2009 to 2014, Dr. Vazquez was an Assistant Professor at The Cancer Institute of New Jersey. Since 2014 he is a group leader at the Cancer Research UK Beatson Institute in Glasgow. Dr.Vazquez research focuses on cancer metabolism, using theoretical and experimental methods.